Why do so many people try dieting, only to fail? What distinguishes those who succeed from those who do not? Are fat people really any different from thin people? What makes us eat, and how do we stop eating? And how can dieting trigger problems with eating normally? 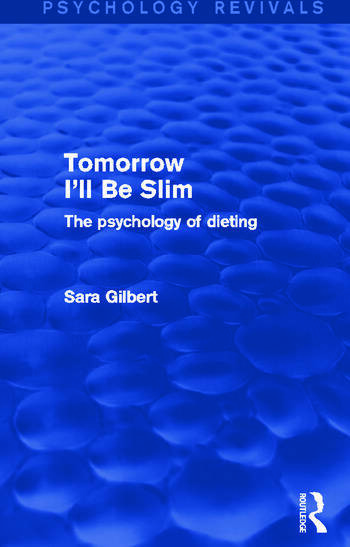 Originally published in 1989, Sara Gilbert discusses these questions in Tomorrow I’ll Be Slim, and draws on what is known about the psychology of eating, overeating, and weight control to dispel a number of popular myths about dieting. She shows how unsuccessful dieting can lead to new problems with eating and weight control. She points out that long-term success in slimming has more to do with individual factors such as a dieter’s expectations, self-confidence, or social and family circumstances than with ‘will-power’; and as much to do with how a diet is managed as with the content of a diet sheet. She suggests ways in which people who want to be slimmer can make a realistic assessment of their need to diet. She explains how individuals who seriously need to lose weight or change the way they eat might draw up effective strategies for themselves and prepare for the inevitable difficulties we all face whenever we try to change old habits. Finally, she addresses the problems of taking the emphasis off dieting and examining our attitudes to a slim figure as the key to happiness itself. Acknowledgements Introduction 1 A Book Without Promise 2 Why Diet? 3 Causes of Obesity 4 What is Hunger? Or ‘Why Can’t I Just Stop Eating When I Want To? 5 Successful Slimming 6 The Dark Side of Dieting 7 Eating to Live 8 Coping with a Diet 1: Defining the Problem 9 Coping with a Diet 2: Planning for Change 10 Alternatives to Will-Power. Notes. Index.